Whether it’s sunny and raining or snowy and gray, Batavia’s weather is dramatically shifting all the time. We’ve just about experienced it all. With a big, unexpected snowstorm on Nov. 25 and 26, Batavia Public School District 101 closed all schools for the day on Mon., Nov. 26. Overall students don’t feel like snow days need to be made up. Eighty-two percent of students asked reported that the snow days tacked on at the end of the school year are in fact, not essential to the completion of their course. As most students know, seniors do not have to make up snow days at the end of the year. The school adds those snow days onto the end of the school year when the students’ finals are already scheduled on a specific date. Those test dates are then pushed back to fit into the snow days which cause problems for not only students but teachers, maintenance, and other staff. More than ninety-two percent of teachers surveyed in a recent poll believed that days made up at the end of the year are not essential for the completion of a course and that they are overall a waste of time. Just one snow day can cause a rippling effect in the whole community’s schedule. The question can then become what would happen to the school system’s schedule if multiple snow days occurred. Time is valuable when it comes to education. When days are lost, so is money. Districts are then put in the position to pay maintenance workers during that time as well as the continuation of pay to the bus companies used by the school. Another inconvenience to consider when snow days are taken would be that throughout the school year teachers use the set schedule as a reference for their planning of vacations in summer; when that schedule is put out of order and the teachers already have that time requested off approved, the school then has to bring in a substitute teacher for that teacher’s classes throughout the day. This causes not only the problem for teachers to try to make a lesson plan in a hurry so that the students’ education is not diminished while they are away, but also an issue for the school to lose money to pay unplanned substitutes. Quite often, we forget that teachers have lives too, an unexpected snow day should not only be enjoyed by students but by the teachers and staff, as well. “Adding days onto the end of the year when you miss class in the fall semester doesn’t make sense,” said Kirk Tanka, a teacher at Batavia high school. Having a teacher emphasize this further creates the idea that snow days are unnecessary at the end of the year. Many schools across the nation have been testing the idea of “E-learning” days where instead of the school district being shut down due to severe weather conditions such as snow days; the school day is completed from start to finish online. Teachers would post assignments online and students would complete it in the safety of their home; away from the severe weather. Thus saving days at the end of the year to be added on if these valuable days were missed. This could be a possible option for allowing students to still keep up on classwork and end on the official end date that was originally set in stone at the beginning of the year. 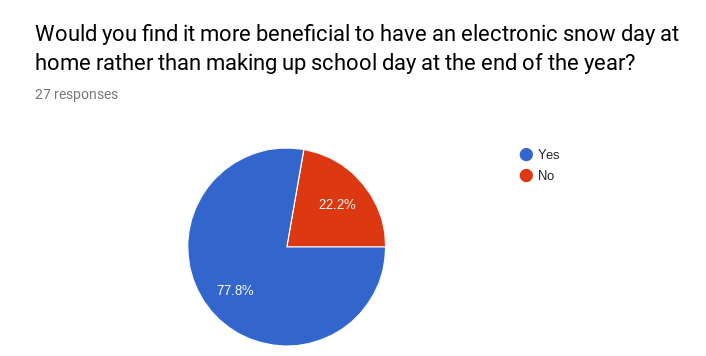 When asked about if having an electronic snow day at home instead of making up the day(s) at the end of the year, seventy-seven percent of teachers surveyed replied that yes it would be more beneficial to assign classwork online than add days onto the end of the year. “E-learning” could be a possible option in the near future for Batavia High School and possibly impact the time and money saved by our district and districts to follow. According to Mr. Dietz, associate principal of academics, BHS requires a total of 176 school days and Illinois state law mandates them to add those snow days onto the end of the year. This could, in turn, ruin teachers’ and families’ timely summer vacation plans, which are dependent on when school lets out. If the school chooses a final end date for school, it only makes sense that they would keep it the same all throughout the year. Consequently, snow days at the end of the year seem quite unnecessary in contributing to our school education. Electronic days or “E-learning” days would greatly be beneficial for both the students and teachers timesake; time that should not be added to the end of the school year due to the weather conditions that occurred on a day that was perfect for education.